Born James Howard Thome on the 27th August 1970 in Peoria, Illinois USA, Jim is a retired baseball hitter who spent 22 seasons in Major League Baseball (MLB), playing for six teams – the Cleveland Indians (1991-2002, and again in 2011), Philadelphia Phillies (2003-2005 and again in 2012), Chicago White Sox (2006-2009), Los Angeles Dodgers (2009), Minnesota Twins (2010-2011), and Baltimore Orioles (2012). His career began in 1991 and ended in 2012. 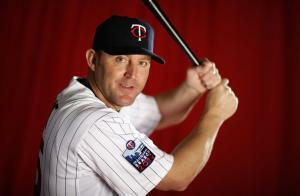 Have you ever wondered how rich Jim Thome is, as of early 2017? According to authoritative sources, it has been estimated that Thome’s net worth is as high as $80 million, an amount earned largely through his successful career as a baseball player. After retirement, he assumed the position of special assistant to the general manager of the Chicago White Sox, which has also improved his wealth. Jim is the youngest of five siblings, and grew up in a sports family, his relatives playing soft-ball and his older brothers baseball. He started practicing baseball with his father on tennis courts and his interest for the game increased. Jim went to Limestone High School with his older brothers, and began playing basketball, while also shortstop in the school’s baseball team, achieving all-state honors in both sports. Unfortunately, he was underweight his entire school career which resulted in Jim ending undrafted. Nevertheless, he enrolled at Illinois Central College, continuing to play baseball and basketball, and after only one year in college, Jim was drafted by the Cleveland Indians in the 13th round of the 1989 MLB Draft. He played two seasons in minor leagues before he was brought up into main squad. His first match was against the Minnesota Twins, playing as third baseman, and he had two hits. Throughout the ‘90s, Jim’s role steadily increased in the Indians’ team, and he became one of the best players of the franchise. During his stint with the Indians, Jim appeared in three All-Star games, and won his only Silver Slugger Award, having posted a record of 334 home runs. However, he struggled somewhat from the start of 1998 season, and four years later after his contract expired, he joined the Philadelphia Phillies on a four-year contract, with a yearly salary of $11 million. He stayed in Philadelphia until 2005, and during that time had two successful seasons, posting 47 home runs in 2003 and 42 in the 2005 season, and won the Lou Gehrig Memorial Award for his contributions on and off the field in 2004. Jim also recorded his fourth All-Star appearance, before he was traded to the Chicago White Sox, partly as Jim wanted to be close to his father now that Jim’s mother had passed away, and he was extremely worried about his father’s health. Also, the Phillies benefited from the trade, since Jim didn’t see much playing time in 2005, due to his injury. Jim felt reborn in Chicago, which resulted in an AL Comeback Player of the Year Award, and his fifth All-Star game appearance. He stayed in Chicago until 2009, posting some good numbers, before constant injuries began to nag him and affect his performance. For the 2009 season he played for the Dodgers, while through 2010-2011 seasons he was a part of the Minnesota Twins, before returning to the Cleveland Indians in mid- 2011 season. Until his retirement, Jim played again for the Philadelphia Phillies and had a short stint with the Baltimore Orioles, before taking the position of special assistant to the general manager of the Chicago White Sox. Although he stopped playing baseball, Jim didn’t officially retire, until he signed a one-day contract with the Cleveland Indians. He became the Indians’ leader in home runs (337), walks (1,008), and strikeouts (1,400). Overall, Jim recorded 612 home runs, putting him in the seventh place on the all-time list. Regarding his personal life, Jim has been married to Andrea Pacione since 1998; the couple has two children together. Jim is also well-known for his philanthropic activities; he was a part of a charitable organization in every city he played in, while also donating to several facilities and organizations, including the Children’s Hospital of Illinois, Children’s Home + Aid, and many others. 1 There's an inner feeling you get when you get in a situation to do well in a game. It's hard to explain. 2 I don't really like filling my brain with a lot of stuff. 3 Every player that plays for any organization, having great fans on your side every night is a great thing. 4 We all make mistakes and sometimes you say things and you really don't realize what you're saying at that moment. 5 You can't play forever. 6 I've always enjoyed interleague play. It gives you a chance to see different clubs, to go to different places. It gives you a good chance to see where you are, where you stand with other teams. 7 When do you know it's time to say, 'OK, that's it?' That is the most difficult part of any decision like that because you don't want to throw the 'R' word out there. I've mentioned it a couple times, but not in the sense that I'm doing it. That word is very fragile. We'll see. 8 It's tough to strike out. Believe me. I hate striking out. It's no fun. It's embarrassing. But there really isn't anything I can do. It's just a part of my game. 9 My family has loved Minnesota and that was one of the big reasons we decided to come back. For me, family decisions were a big part to coming back to the Twins. 10 You always want to get at-bats. You always want to contribute. 11 I sign every autograph I can for kids because I remember myself at that age. I think it's ridiculous that some guys won't sign for a kid. 12 My favorite thing to do is still to go back to Peoria, go to my cabin and hunt with the boys. This is a great lifestyle, don't get me wrong. But fun for me is going back with my buddies I grew up with. 13 Charisma's good every night. Something special is always about to happen. You've got to believe it. 14 My dad told me when I went into high school, 'It's not what you do when you walk in the door that matters. It's what you do when you walk out.' That's when you've made a lasting impression. 15 I really do try hard to be a good teammate. I can't run very fast, but I try to always run hard. I may strike out a lot, but I try to walk to set up the guys who are hitting after me. 16 The strongest thing I put into my body is steak and eggs. I just eat. I'm not a supplement guy. Steroids are not even a thought. 17 Is my ability what it was at, say, 25 or 30 years old? Probably not, but I like to compete. I like to go out and play the game hard. 1 Inducted into the Cleveland Indians Hall of Fame in 2016. 4 Son Landon, born 16 November 2007. 5 Sister, Kari Thome, engaged to Sam Stevens. 6 He and his wife welcomed a baby son in mid-November. 7 Made major league debut on 4 Spetmeber 1991. 8 Daughter, Lila Grace, born on December 15, 2002. 9 Milestone home runs: 1 - October 4, 1991, at Yankee Stadium, off Steve Farr; 100 - May 14, 1997, at The Ballpark in Arlington, off Bobby Witt; 200 - April 15, 2000, at Jacobs Field, off Mark Clark; 300 - June 2, 2002, at Hubert H. Humphrey Metrodome, off Eric Milton; 400 - June 14, 2004, at Citizens Bank Park, off Jose Acevedo; 500 - September 15, 2007, at White Sox Stadium, off of Dustin Moseley;. 10 In the next-to-last game at Philadelphia's Veterans Stadium, Thome became the last player to hit two home runs in a game at the stadium. His second home run of the game was also the last one ever hit there. 11 Hit 47 home runs to win National League home run title in 2003, his first year with the Philadelphia Phillies. The total was tied for the Major League Lead with Alex Rodriguez of the Texas Rangers. 12 Cleveland Indians All-Time Walks Leader (997). 13 Cleveland Indians All-Time Homerun Leader (334). 14 First Baseman for Cleveland Indians (1991-2002), Philadelphia Phillies (2003-2005) and Chicago White Sox (2006-present). 15 1988 graduate of Limestone High School where he was All-State in baseball and basketball. Played baseball and basketball at Illinois Central College. Was Junior College All-American honorable mention. Served as honorary co-chairman of the United Way Home Run Derby over the last five seasons.